NEW DELHI Feb 12 : Visiting Minister for Energy, Water Resource and Irrigation Barshaman Pun and Indian Minister for Water Resource, River Development and Gange Rejuvenation Nitin Gadkari discussed bilateral issues at a meeting in here today. On the occasion, Gadkari shared that India was expanding its inland waterways up to Trivenighat along the Nepal-India border within a year and urged the Nepal government to take maximum benefit out of it. The Indian side had said that Nepal can take more benefits from the waterways adding that the route up to Trivenighat would be completed linking Kolkatta to Haldiya in India to Narayani river in Nepal. 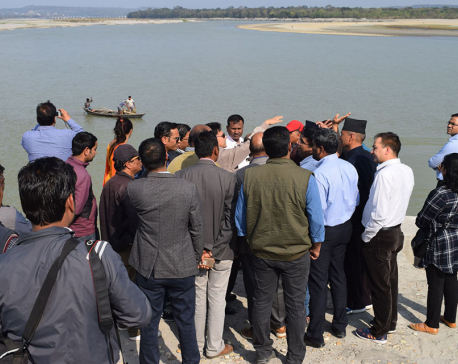 Present at the minister-level meeting, Spokesperson of Nepal Electricity Authority (NEA) Prabal Adhikari said that the two ministers held discussions on key issues regarding the ongoing progress taking place in water transportation. Likewise, Minister Pun and his Indian counterpart Gadkari also touched upon the issues to bring ship into operation that was discussed with the Indian leaders during Prime Minister KP Sharma Oli’s last India visit. India is developing some 1,400 kms long waterways from Kolkata to Haldiya to Banaras. Furthermore, the two leaders also held discussions on the long-stalled Pancheshwor Multipurpose Project. NEA’s Executive Director Kulman Ghising, Indian Ambassador to Nepal Manjeev Singh Puri and others were also present at the meeting.